Meet Brad and Michele, a former cake delivery person and office manager turned Groutsmith franchise team in North Pittsburgh, Pennsylvania. Since starting their franchise in 2017, these co-owners have streamlined their operations, gained a reputation for being the premier grout and tile service in their area, and have taken the first steps toward scaling up. This is their success story. Brad Young and Michele Morrow had no business ownership experience when a relative who owned a Groutsmith franchise encouraged them to consider the opportunity. Knowing they were prepared financially and ready to go through the training, Brad and Michele were struck by the how family-orientated the business was. The support system offered by other franchise owners around the country was a major benefit since neither had prior experience. A lack of competition for dedicated grout and tile service providers gave them a unique opportunity to be the premier provider in their area. Now a year into their business, Brad and Michele feel it fits nicely with each person’s strengths, even without having had any prior experience. Brad manages their technicians and estimates while Michelle oversees the admin tasks back at their home office. While their business is only about a year old, the business is poised to grow significantly as they continue to scale up. Read the full story, packed with Brad and Michele’s own words below. Brad and Michele are perfect examples of how The Groutsmith offers something for everyone regardless of prior experience or expertise. Before becoming Groutsmith franchise owners, Brad was a former cake delivery person and car salesman. Michele was a professional office manager. Both found a way to apply their diverse skill sets as business owners. 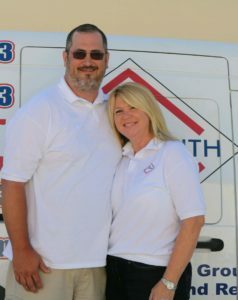 Brad and Michele’s first introduction to The Groutsmith was made through Brad’s step-brother, who owned a Groutsmith franchise of his own in Texas. After non-stop encouragement, Brad and Michele decided to follow his advice and head out for training. When they arrived in Florida for the two-week training program, Brad and Michele were immediately struck by the sense of family among the corporate team and other franchise owners––something that resonated with them deeply. Some home services providers offer supplementary grout and tile services, but very few dedicate themselves to making it their primary focus. That’s where The Groutsmith fills a major gap for homeowners and businesses. In addition to a strong support system, Brad and Michele realized they could bring a brand new kind of service to North Pittsburgh and immediately tap into a market that no other company could. It can be tough to find a business well-suited for co-owners. 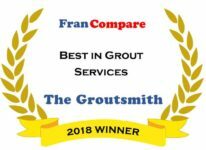 The Groutsmith is one of the few that figured out the formula––a fact demonstrated by the many co-owners growing their franchises around the country. For Brad and Michele, their respective talents carried right over into their work life as Groutsmith owners. Brad’s work days are spent doing what he does best: managing the technicians doing the work, doing estimates, and conducting demos for new customers. Michele typically holds down the fort back at the office––drawing on her management skills to handle scheduling, new customer inquiries, finances, and more. In addition to an ideal daily routine, Brad and Michele say their favorite aspect about being a Groutsmith franchise owner is the reaction from customers and the ability to extend that feeling of family to staff. Interested in learning more about our unique franchise opportunities?